The Oxo Barista Brain Conical Burr Grinder features 15 grind settings and a built-in scale. Users can also select the number of cups of coffee they plan to make and the grinder will process the right amount of beans. IKEA has a dedicated team of product namers that uses a database of Swedish words to identify new items and sticks largely to an established naming convention for each category. For example, all kitchen accessories are named after adjectives, mushrooms and fish. Canadian entrepreneur Robert Wang and two friends designed the Instant Pot during the housing crisis of 2008, reasoning that financially-stressed consumers would be interested in a multipurpose appliance. Instant Pot is a success because it is pressure cooker as well as a rice cooker, food warmer, slow cooker, saute pan, steamer and yogurt maker. Wal-Mart is revamping its raise and training structure for some workers, implementing annual raises that are given on the same day and cutting the training time for new employees slated to earn $10 per hour. Through the changes, the retailer, which employs about 1.5 million workers, is aiming to give workers more confidence and help them advance their careers more quickly, said Judith McKenna, operating chief of Wal-Mart US. Giant Food of Maryland is testing signs that rate the sustainability of grocery items as "good" "great" and "best" to provide shoppers with guidance that's increasingly in demand. Giant has partnered with HowGood, which can rate most of a store's products independently on factors including animal treatment and pesticide use. Schnucks is one of the grocery chains partnering with Instacart to bring delivery services to the St. Louis area. Other retailers in the city that are adopting Instacart beginning in February include Shop 'n Save, Whole Foods Market and Costco. The Int'l Home + Housewares Show features more than 2,200 exhibitors and attracts more than 62,000 attendees. Find Home + Kitchen Products, Design-driven Innovations, Cleaning + Home Organization and Electrics + Home Healthcare. Register for your badge in advance to save the $100 onsite fee. 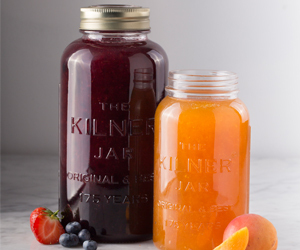 To celebrate their 175th anniversary, Kilner® is reintroducing a design classic. The Kilner® Anniversary Jars mirror the styling and finish of the original Kilner® Jar, with updated features suiting modern needs. Kilner® Anniversary Jars are not only products of the company's heritage, but also symbols of their continued focus on quality and design. The gauge of pending home sales rose 1.6% in December from the previous month, according to the National Association of Realtors, exceeding an expected 1% gain. The increase in contract signings suggests that borrowers have adapted to rising mortgage interest rates. Friday is the deadline for International Home + Housewares Show exhibitors to enter their latest creations and cutting-edge innovations in the IHA Global Innovation Awards (gia). To be eligible, a product must be entered in the New Product Showcase by Friday’s deadline. All finalists will be spotlighted in a display in the Hall of Global Innovation. A panel of expert judges, including seasoned designers, retailers and industry experts, will select submissions that represent the best in each of 13 product categories, and the winners will be announced at the invitation-only gia dinner March 18. Learn more. Most trade show books, seminars and consultants tell exhibitors how to pick the show, set up a booth and get everyone organized. Trade Show Samurai, however, teaches what to do in the booth to turbo-boost your success. During this complimentary webinar at noon CDT tomorrow, Mike Moyer offers tips that exhibitors can do before, during and after the International Home + Housewares Show to accelerate their trade show strategy and capture more sales leads than they could imagine. Whether a first-time exhibitor or a seasoned professional, this program is well-suited for anyone who exhibits at trade shows. Sign up today.